It happened just last week, when I popped into the grocery store to pick up a few things to get through the rest of the holiday season. I was making great progress – moving fast, all business, when I rounded the corner into the snack aisle and slowed down to grab a box of Triscuits. Original, family-size if possible. Now, I don’t shop at this particular grocery store very often, so I was completely unprepared for the Great Wall of Triscuits that awaited me. 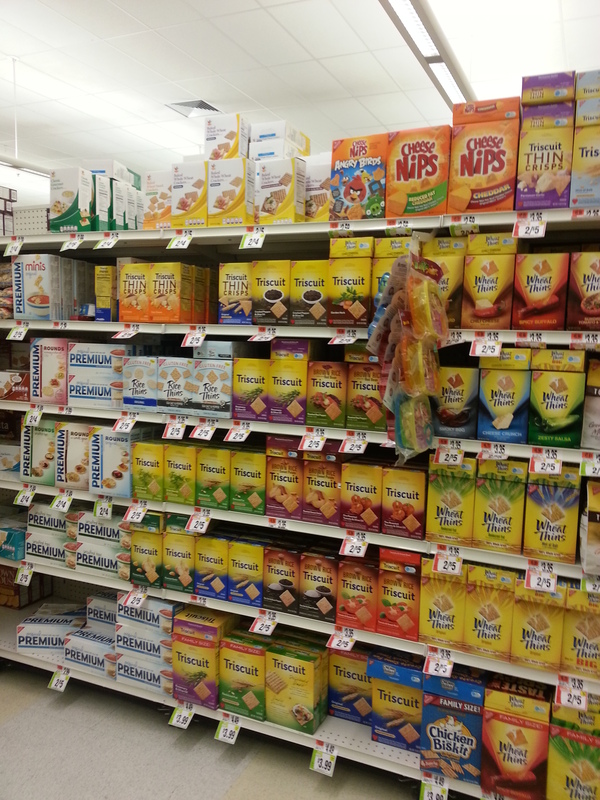 Holy shelf space, Nabisco! I was forced to come to a full stop to consider my options. There were Low Sodium and Reduced Fat varieties of course, but from there the choices unfurled into the farthest reaches of the flavor universe. Rosemary & Olive Oil. Savory Red Bean. Roasted Sweet Onion. Something involving sweet potatoes. What the…? Where were my Original Triscuits? Nowhere to be seen! Just a sad, empty space on the bottom shelf where they should have been. Come to find out, Nabisco launched a whole new line of Triscuits just last spring in an effort to appeal to the evolving tastes of modern snackers. According to Ad Age, consumers are eating more snacks and fewer traditional meals. This might explain why many of the ingredients we’re used to seeing on our dinner plates have made their way into the cracker bin. But can brown rice and sea salt truly be the recipe for success, especially when it comes at the expense of delivering the core product to a loyal consumer? This may have been the holiday fatigue talking, but it struck me that day at the grocery store that perhaps the Triscuit brand had been stretched a little too thin. Just like a lot of people I know. We all have different roles to play in our lives – we’re moms and dads, husbands and wives, coworkers, coaches, friends. We give our time and talents to the people and causes that matter to us, and that’s a good thing. But sometimes we end up stretching and twisting ourselves too far in our efforts to help and please others, and that’s a bad thing. Each of us is an Original, but if we lose touch with our core interests and passions, we risk losing ourselves altogether. And possibly spending the rest of our lives trapped in a maze of fire roasted tomato crackers. To avoid this terrible fate, I’ve resolved to get back in touch with one of my core interests – writing – by starting this blog. I have absolutely no idea where it will lead, but you’re invited to come along for the ride and enjoy some stories and humor along the way. I’ll do my best to keep it light and easily digestible. This entry was posted in That's Life and tagged Core Interests, Grocery Store, Roles, Triscuits. Bookmark the permalink.